Mobility in the form of permanent migration, return or out-migration can provide individuals with gainful employment, better jobs and a higher level of earnings. But as a growing number of studies are suggesting, the gains from migration should not be strictly evaluated from the utilitarian approach but subjective well-being indicators should be taken into consideration. 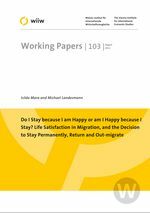 The purpose of this study is to test how life satisfaction during the migration experience determines the preference to stay, return or out-migrate by controlling not only for economic but also for social and subjective well-being determinants. We aim to address this analysis by combining two streams of research: the one on migration and return decisions and the one on life satisfaction and subjective well-being, so as to broaden the analytical framework by adding some of the main findings from other social sciences. The results of the study confirm that, once in the destination country, migration intentions such as to stay permanently, to move to another country or to return home are strongly linked to the assessment of life satisfaction through diverse social and economic drivers. For women, life satisfaction is not only a good predictor of migration preferences but also a mediator, whereas for men this is not confirmed. Determinants that appear to be positively linked with life satisfaction are civic participation and housing which correlate with migrants reporting high levels of life satisfaction.